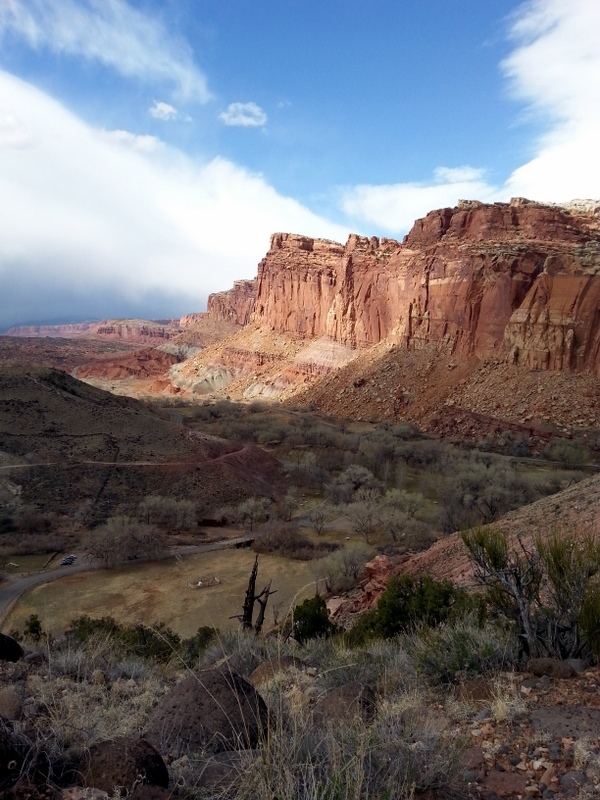 Capitol Reef was elevated to National Park status (from Monument status) in 1971. It’s still pretty small by NPS standards, but what a treat. John queried a Ranger about hikes that we might possibly cycle to, as we are generally loathe to drive once we arrive in camp. The Ranger asked if we could ride gravel roads. When John nodded, the Ranger knew he had found the perfect fools for his plan. 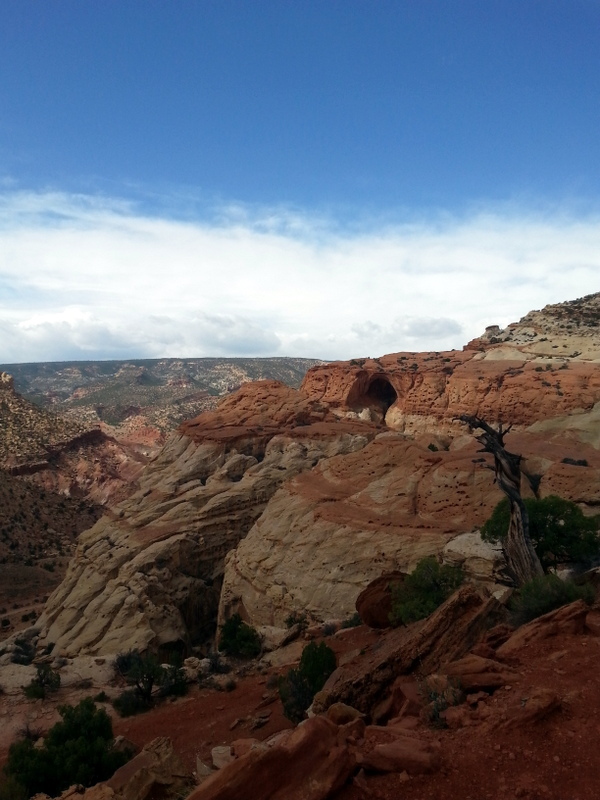 All we need to do is cycle about four miles down the scenic drive, then turn down the gravel road toward the Grand Wash. Park at the end, hike up to Cassidy Arch, then partway down to the Frying Pan Trail. That will connect us to Cohab(itation) Canyon Trail, which will drop us back off in the campground. Then, we drive back in the truck to pick up the bikes. Total hike – about 7 miles. Great vistas, fairly strenuous. Off we go. Oh man, it is beautiful out here. 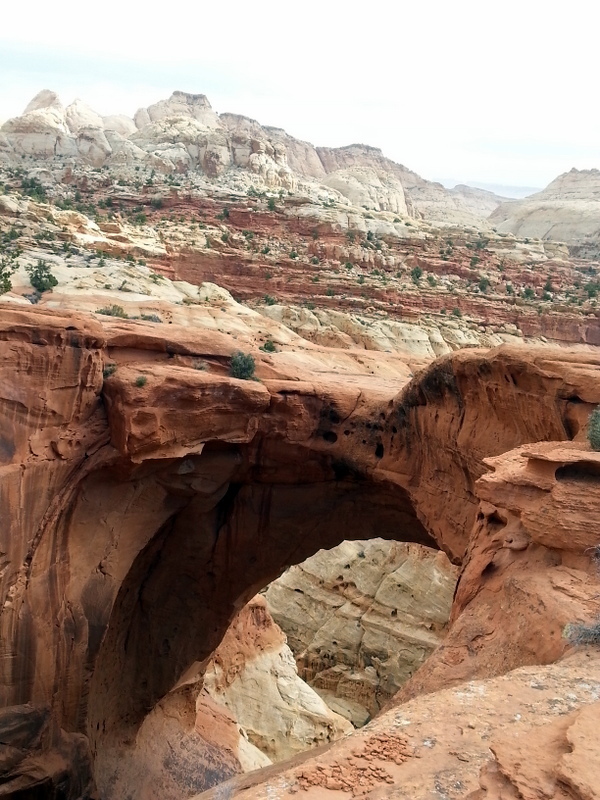 The hike up to Cassidy Arch is kind of fun, kind of scary. Our first view of Cassidy Arch from the trail. 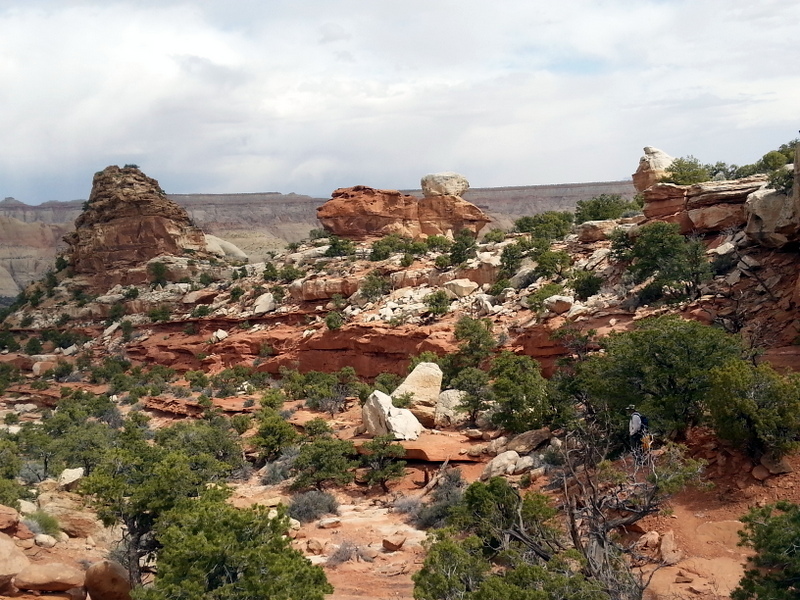 Lots of exposed slickrock, which is easy to navigate as long as you don’t look down too often. We wound up on top of the arch. It was amazing. One of the best hikes, ever. Our first screwup was heading back down to the place where our trail would meet the Frying Pan Trail. We totally missed the junction, and hiked nearly back to our bikes before realizing our error. So, we turned around, and hiked all the way back up. A lot of elevation to hike a second time, and we still had several miles to go. The Frying Pan Trail was gorgeous. Up and down across great expanses of slickrock. Fantastic vistas. But, it was endless. We finally hit Cohab Canyon, so named because it was where the Mormons (many of whom practiced polygamy) used to hide from federal agents who were hunting them. 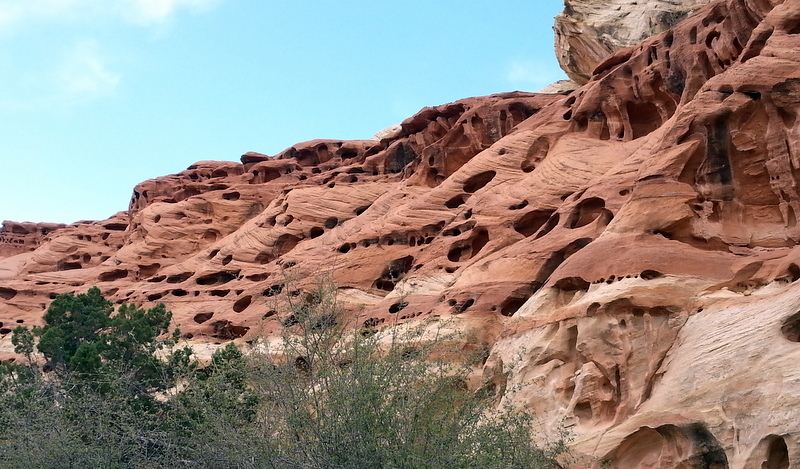 Above us are soaring sandstone structures, some like with holes like swiss cheese from sedimentary deposits which have eroded. Black boulders from ancient volcanos are everywhere. We liked this lizard-like branch. Wound up with about 9 miles of hiking. A bit more than we bargained for. 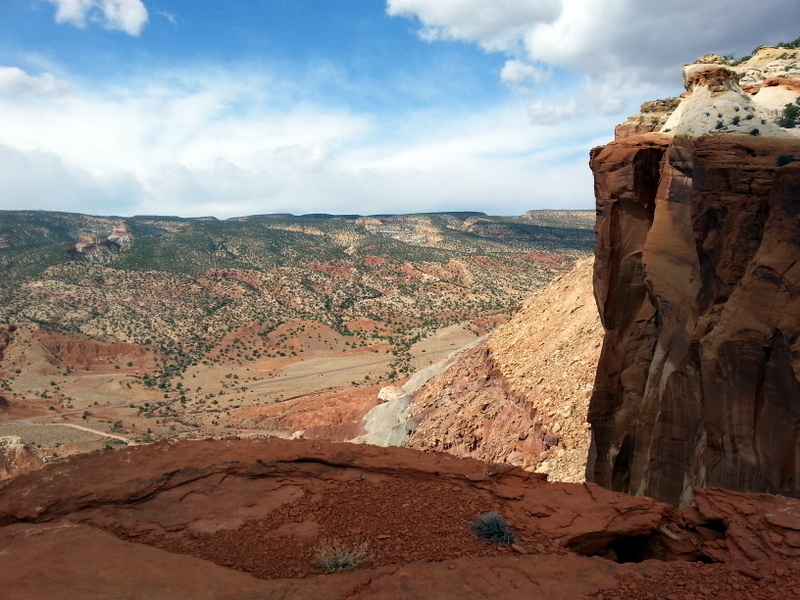 Next day, we decide to hike into the Capitol Gorge. 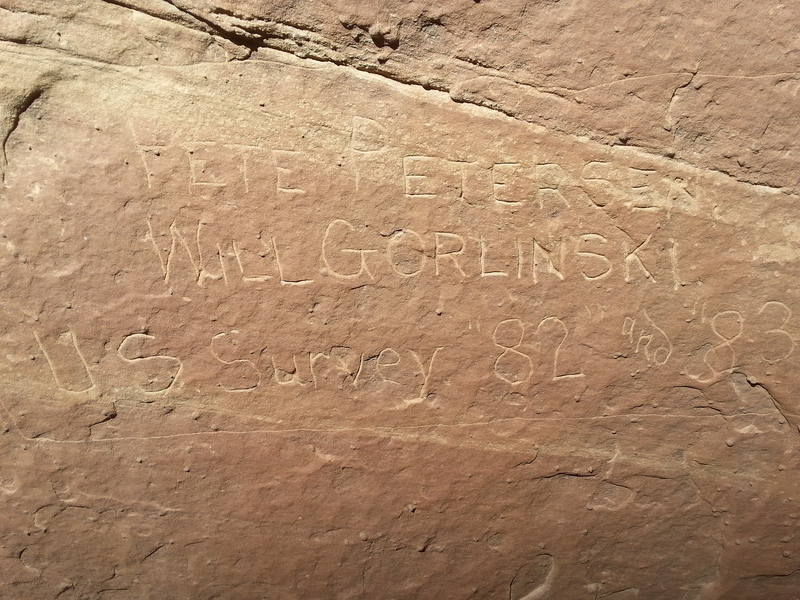 There’s a segment there called the Pioneer Register, where scores of names of early pioneers etched their names into the sandstone as they traveled through the area. 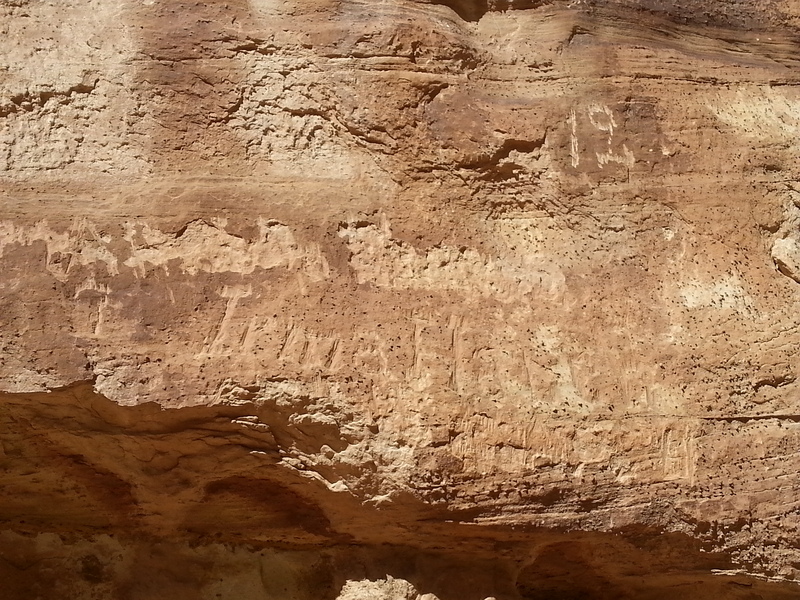 We hiked deep into the Gorge, passing one astonished bighorn sheep, finally resting for a bit in a shady sandstone cave. 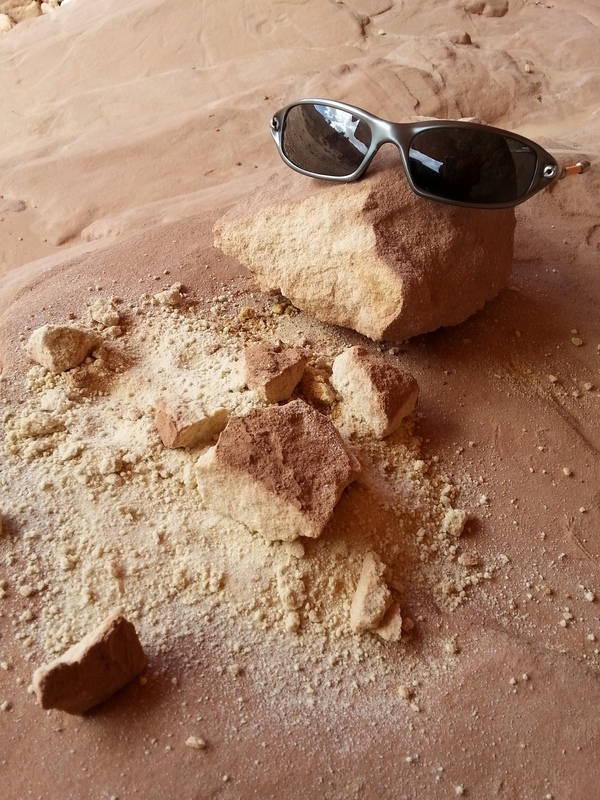 Some of this sandstone is so fragile that is can be easily crushed by hand. We staggered to the truck after about 6 miles round trip, pretty tired from two days of hikes. This has just been another spectacular stop for us. Had a bit of snow, big winds (gusts of 40mph), a touch of rain. 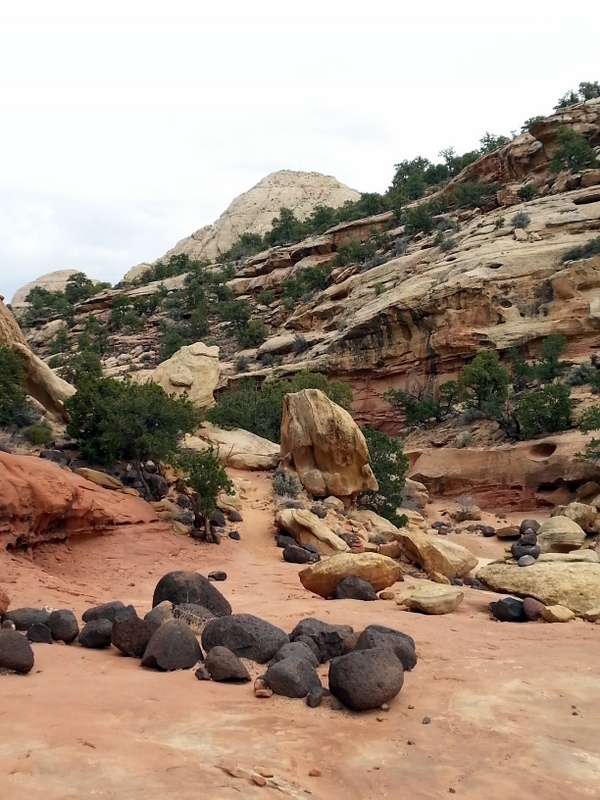 We took in a wonderfully informative Ranger program on geology, and had a great camping experience. The area is full of remnants of the early Mormon settlements, including the extensive orchards, which are just beginning to blossom. We could easily stay here for several more days, but Valley of the Goblins State Park is calling our name. Onward….. 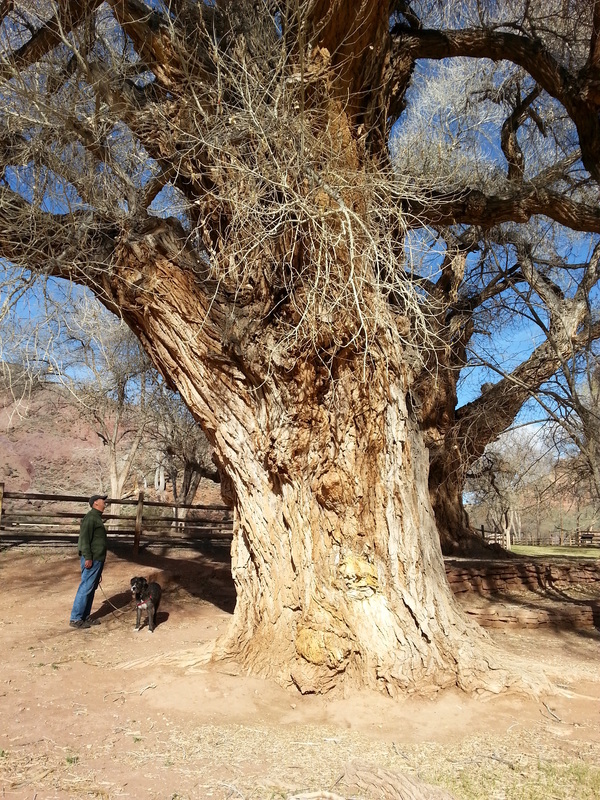 This entry was posted in camping, great outdoors, hiking, national parks, retirement, RV life, simple camping, T@DA, Utah and tagged camping, hiking, national parks, T@DA, the great outdoors, Utah by Judy Crankshaw. Bookmark the permalink. You will love it. Maybe you and I can ride like crazy women and get there on out bike trip!need way more time in each of these big National Parks. We haven’t scratched the surface yet. Another WOWIE from this cozy gal! You “rocked” the hikes! Better to rock than roll, we’ve decided. Awesome scenery nicely photographed! I had never heard of this park before, now I really want to visit it. You really should. I’ll be your photo equipment mule. We can’t wait to get back, either. I’m out of adjectives at your photos. Just WOW x 2. Amazing photos Judy. Keep them coming!